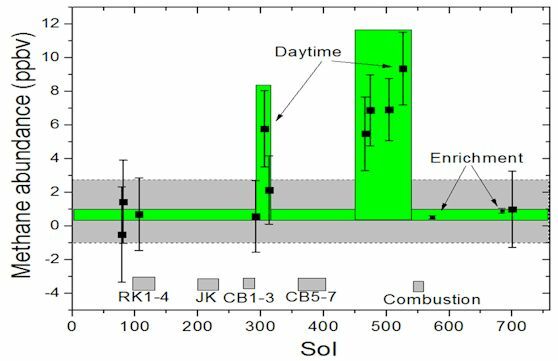 Dec. 16, 2014: NASA's Mars Curiosity rover has measured a tenfold spike in methane, an organic chemical, in the atmosphere around it and detected other organic molecules in a rock-powder sample collected by the robotic laboratory’s drill. Organic molecules, which contain carbon and usually hydrogen, are chemical building blocks of life, although they can exist without the presence of life. 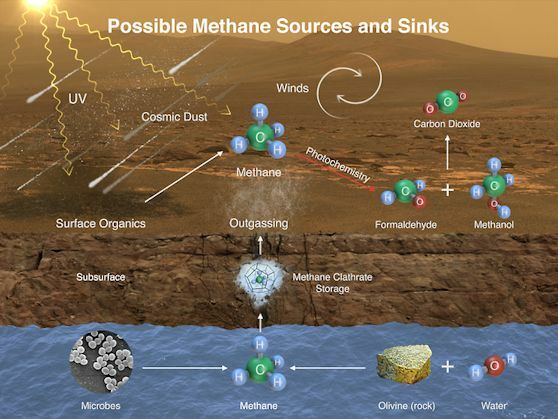 Curiosity's findings from analyzing samples of atmosphere and rock powder do not reveal whether Mars has ever harbored living microbes, but the findings do shed light on a chemically active modern Mars and on favorable conditions for life on ancient Mars.